Kahuna Creations is the inventor of Land Paddling | Street SUP. Stay up to date with the latest and greatest from Kahuna Creations along with bonus information about the sport of land paddling. Aloha Kahuna Boardriders! Fall is an awesome time to ride with your Kahuna Creations board and landpaddle. The air is clear, the heat has broken and its time for some fall riding. Check out our new product launch and some of the happenings this past summer as you get stoked for fall! 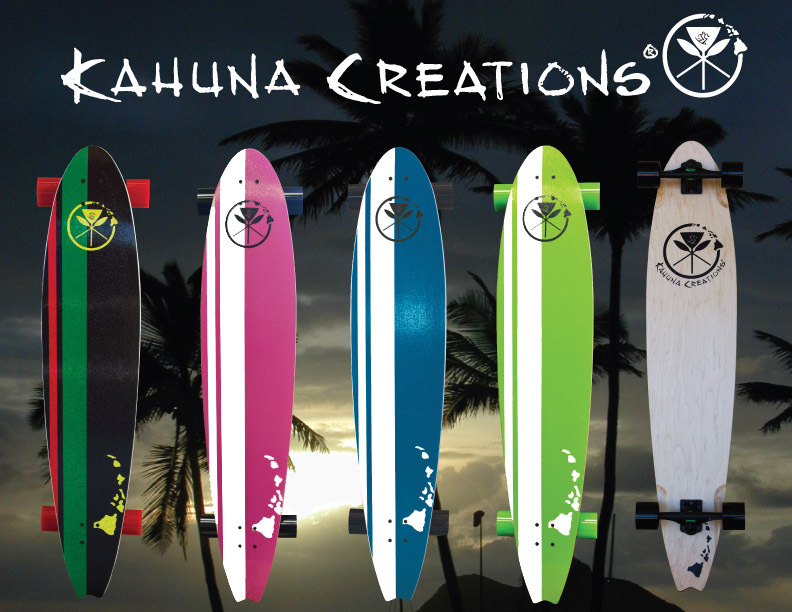 The newly designed boards feature the Hawaiian islands as well as the Kahuna Creations logo. The Retro Beach Boards have beach sand mixed into the top coat to create a beachy, fun board riding experience. Super flexy and sweet to ride. Great for school or cruising around town. AVAILABLE EARLY OCTOBER,Watch our facebook page for announcement! facebook.com/kahunacreations. We are looking for artwork for the latest version of our Magma Pro Shredder longboard. Artwork should incorporate volcanic and lava features that will blow everyone away! If your design is selected to be the new Kahuna Creations Magma Pro Shredder II, you will receive $200 cash, a new longboard featuring your design and bragging rights as a Kahuna Creations longboard artist. We hope we get some incredible designs from the Kahuna Nation! BTW, if none of the designs meet expectation, Kahuna Creations reserves the right to not make a selection. Kahuna Landpaddling Race in Switzerland! 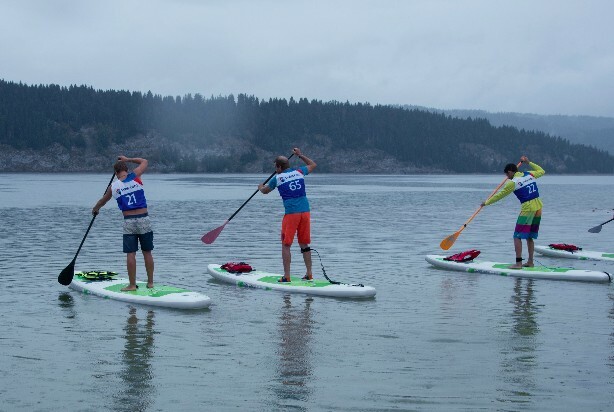 Kahuna Creations' Switzerland partner, Sportmania, organized an awesome Kahuna Landpaddling/SUP biathlon event. Competitors gathered on the beautiful Lac De Joix shoreline. Dozens of competitors entered the competition and had a blast. Many thanks to Debora Zurru, owner of Sportmania, for organizing the event and spreading the Kahuna love. Debora was stoked, "The event was fantastic! All the competitors and fans had an incredible time. When I promoted the event on Facebook there have been so many shares from SUP groups and lovers I could not believe it! We expect next year's event to grow and continue to flourish." 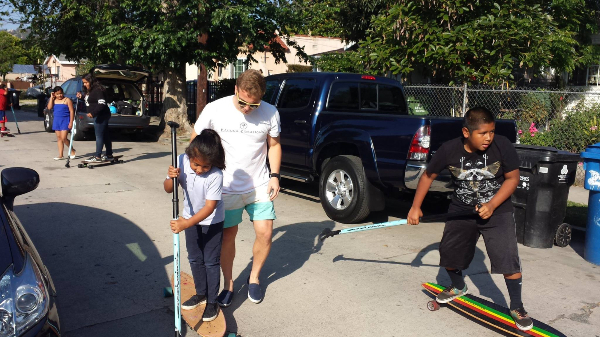 USC student JJ Kirkpatrick reached out to the USC community to support a great cause of introducing underprivileged families to fitness equipment. Kahuna Creations' own Hank Rubenstein and USC alumni offered to help. 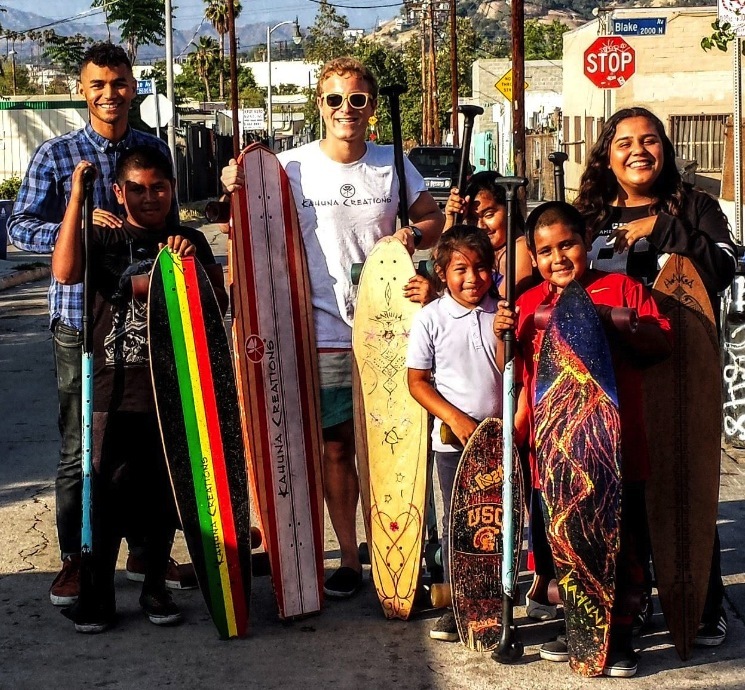 Kahuna Creations was happy to donate multiple sets of longboards, Kahuna Sticks and of course some helmets to meet the community's needs. Hank stopped by one of the family's home and gave the kids instruction. The Kahuna Creations' donation meant so much to the community and It was awesome to watch the kids thrive and light up when they started riding! It was an honor to help the Los Angeles community introduce great fitness products to their children. "To see the excitement in the eyes of these great kids was incredible. They jumped on the longboards and landpaddles and had a blast. There was good feelings everywhere" Hank Rubenstein, Kahuna Creations marketing. 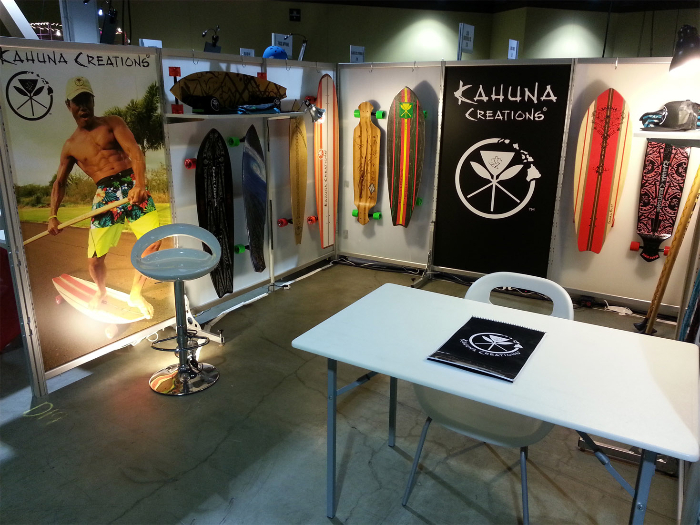 Kahuna Creations rocked the Agenda trade show in southern California this summer. The highlight of the show was the live artwork by Samoan Chief Su'a Freewind, owner of Black Wave Tattoo in Los Angeles, CA. 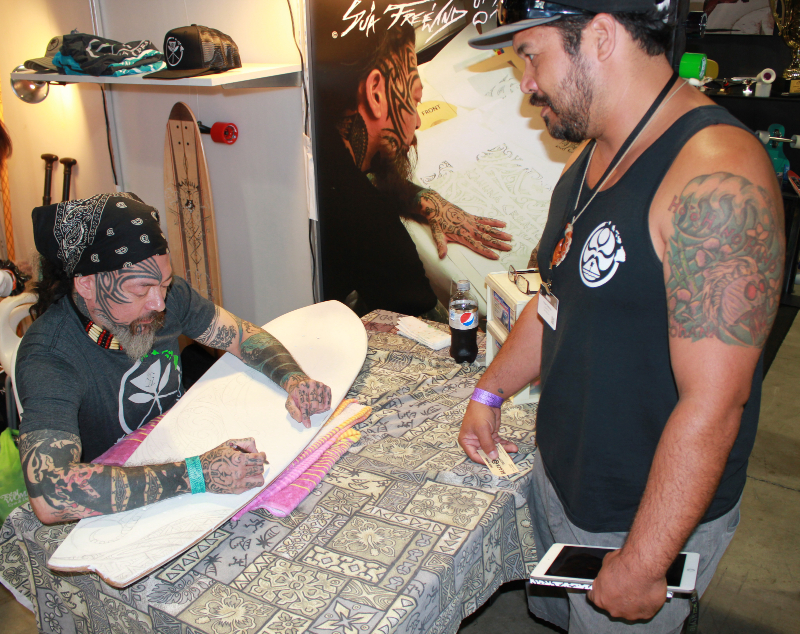 He began his artistry of a custom Polynesian tattoo board which will eventually be added to the Shaka Longboard Series. Chief Freewind has been featured on National Geographic for his tattoo work and is one of Kahuna Creations' master board artisan. We had a great time visiting the North Shore Surf Shop crew in Haleiwa, Hawaii on the legendary north shore of Oahu where it all happens. North Shore Surf Shop is THE #1 surfshop in Hawaii and is rolling with the Kahuna Creations brand. When you are in Oahu make sure you stop by the North Shore Surf Shop to get all of your surfing and Kahuna Creations long boarding gear. Franc Mendez is a recent addition to the Kahuna Creations 'Ohana and is stoked to share his experience. 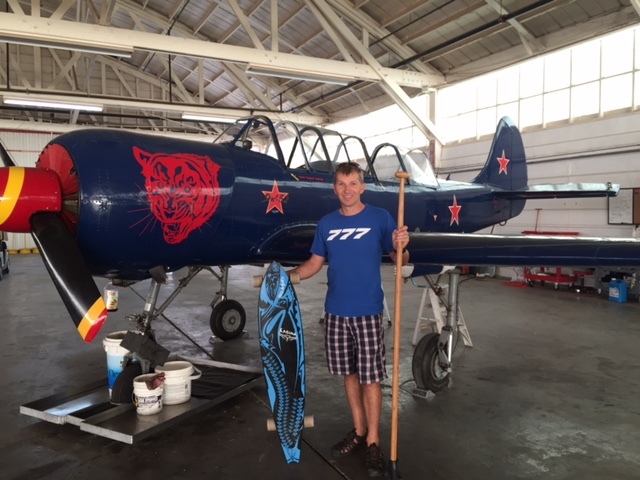 Aside from land paddling, Franc spends his time piloting vintage aircraft, his favorite being the Russian Warbird Yak 52. Franc flies for fun and in formation with other warbirds. Franc says, "It's not everyday that one finds something this exciting as land paddling. I live in Phoenix, Arizona, but I'm formerly from South Africa. I like living in Phoenix, but I'm not close to water so I miss kayaking and water sports. I wanted to get into SUP having tried it in Hawaii, but I live at least 40 minutes drive from anywhere that would make SUP practical. This is what made Kahuna Creations and the sport of land paddling so appealing." Franc continues, "It's important to stay fit and healthy for my job. I'm a long haul Boeing 777 pilot. My flights range from 12 to 15 hours long so I try to exercise between flights. I find running boring and it is tough to stay motivated to hit the gym. Land paddling on my Kahuna longboard gives me a fun total body workout. I highly recommend it as part of an exercise regime!"